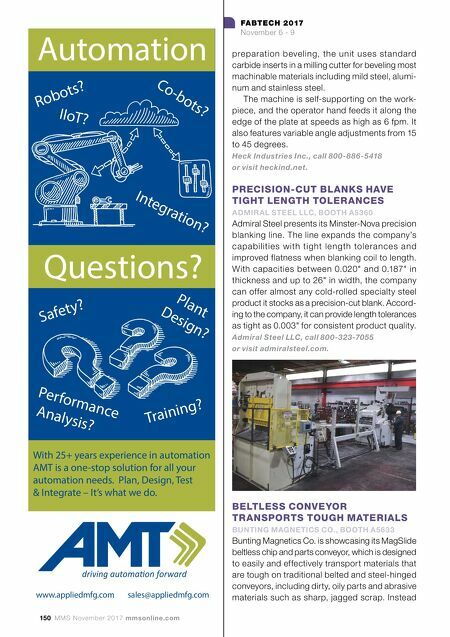 mmsonline.com November 2017 MMS 151 FABTECH 2017 November 6 - 9 lang-technovation.com Pre-Stamping, Clamping, Automation – Innovative clamping solutions for highest holding power and process reliability from one source! 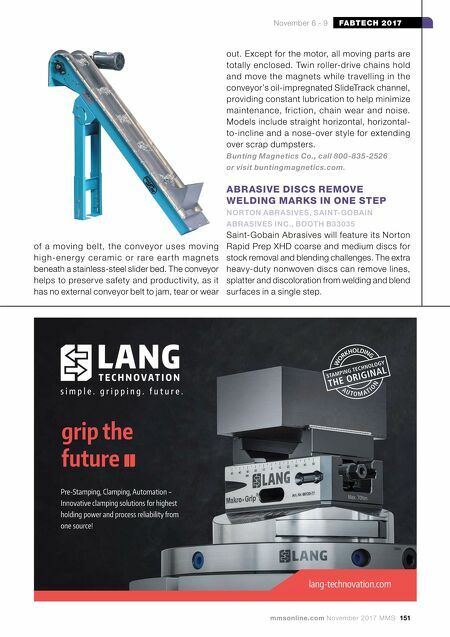 grip the future of a mov ing be lt, the conveyor use s mov ing h i g h- e n e rg y c e ra m i c o r ra re e a r th m ag n ets beneath a stainless-steel slider bed. The conveyor helps to preserve safety and productivity, as it has no external conveyor belt to jam, tear or wear out. Except for the motor, all moving parts are totally enclosed. Twin roller-drive chains hold and move the magnets while travelling in the conveyor's oil-impregnated SlideTrack channel, providing constant lubrication to help minimize maintenance, friction, chain wear and noise. Models include straight horizontal, horizontal- to-incline and a nose-over style for extending over scrap dumpsters. Bunting Magnetics Co., call 800-835-2526 or visit buntingmagnetics.com. ABRASIVE DISCS REMOVE WELDING MARKS IN ONE STEP NORTON ABRASIVES, SAINT-GOBAIN ABRASIVES INC., BOOTH B33035 Saint-Gobain Abrasives will feature its Norton Rapid Prep XHD coarse and medium discs for stock removal and blending challenges. The extra heavy-duty nonwoven discs can remove lines, splatter and discoloration from welding and blend surfaces in a single step.